My FB live this week featured the fabulous Petal Palette stamp set and its matching Petals and More framelits. I shared a couple of projects with you and thought I'd share some close-up photos of two of my projects. 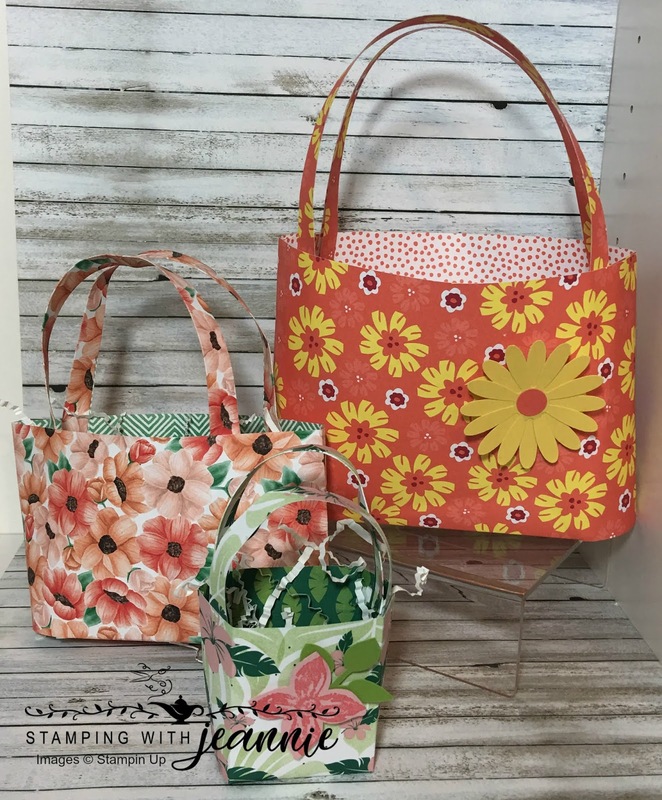 It has also been my Product Spotlight on my FB page. Make sure you like the page so you can see more samples that I'm sharing this week! 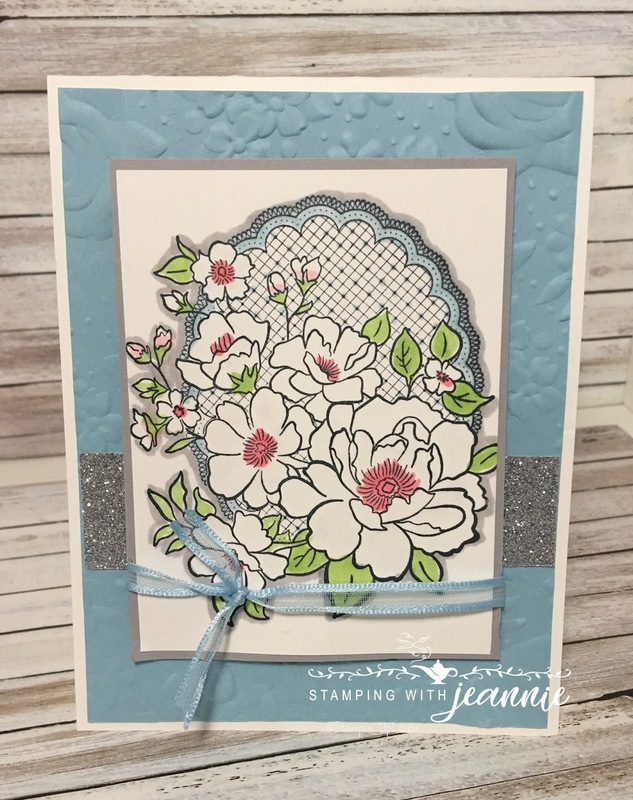 This first project used the Buffalo Check background stamp set with Tuxedo Black Memento ink. I stamped the buffalo check so that I could have a black and white background. Unfortunately, the Botanical Butterfly DSP from Sale-a-bration has retired so I needed to come up with another black and white option. 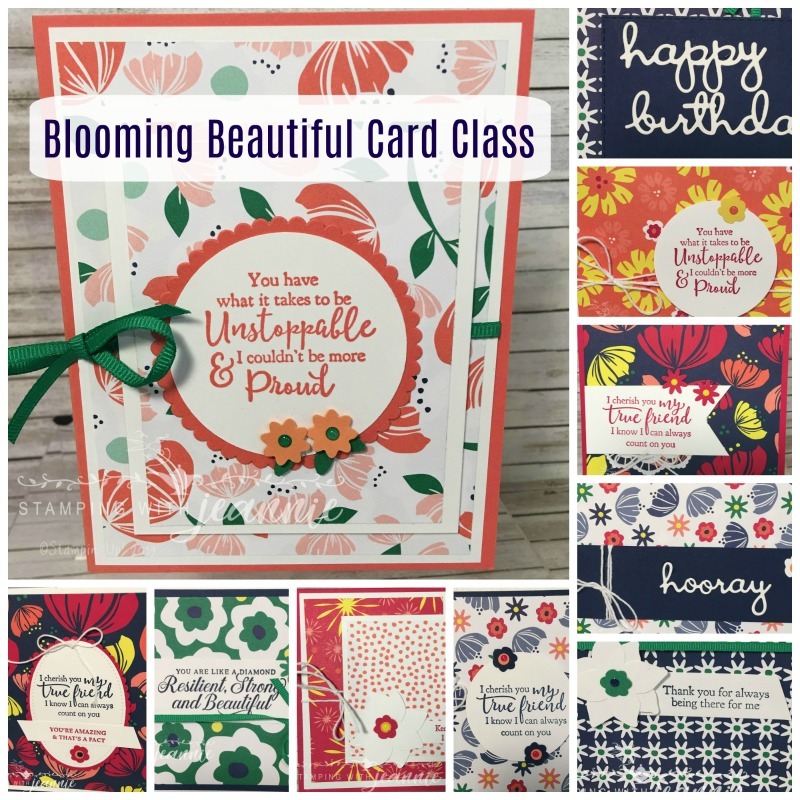 (For my own use, I stockpiled that DSP and can't wait to use it on some personal cards!). 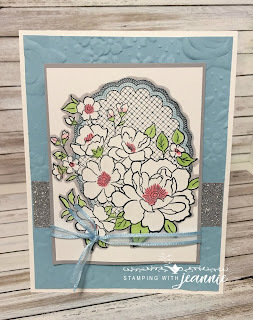 I used the label die from the Rose Trellis thinlit dies (matching the Climbing Roses stamp set and also retiring. 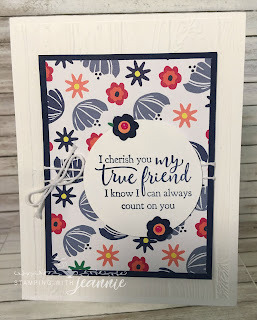 (Insert :( face here - loved this stamp set and matching dies!). 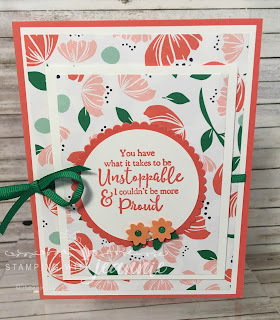 The sentiment is from the Petal Palette stamp set and the ribbon is the lovely Petal Pink and Whisper White 5/8" variegated ribbon that is retiring from the Occasions catalog. My next 2 projects are 3D projects and again use retiring products. I made my birds for the bird cage and the wooden box using the Mirror Image technique (go to my FB page Jeannie Nielsen, the Card Lady) for a quick instruction of the the technique -- I taught it ib yesterday's FB live video (4/23/19) (Hint ... I used the Silicone Sheet and the Stamparatus) to make the birds facing in opposite directions for both projects. I can't share the instructions for the bird cage right now as it's a project that Debby Donovan will be teaching at our June crafting retreat. 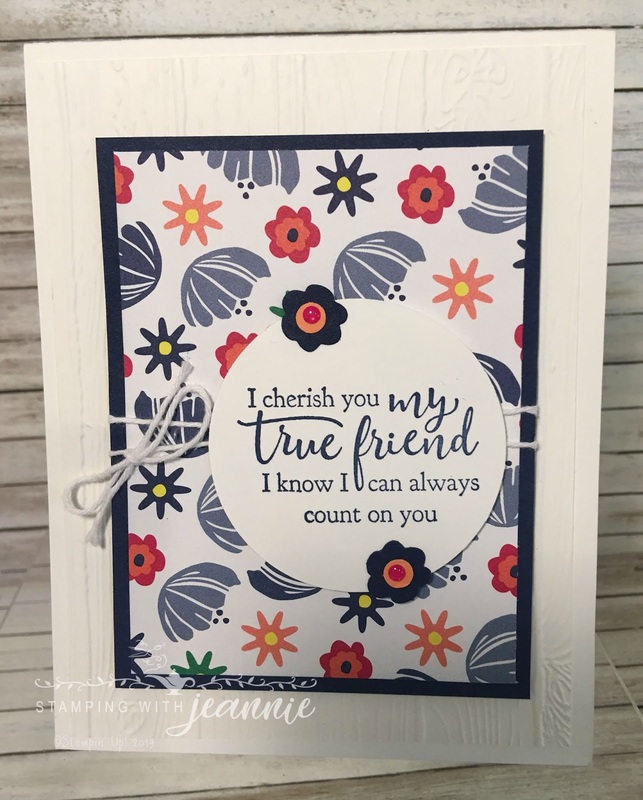 The Wood Words stamp set with the Wood Crates thinlits are also retiring. I filled my little crate with leftover Easter egg candy! Before you panic ... the Colorful Seasons stamp set is not retiring -- I used the branch from the matching framelits to create the branch for the birds to sit on. The designer paper is my favorite Wood Textures DSP stack. The flowers also are stamped in Powder Pink ink and are from the Petal Palette stamp set so those items ARE retiring too. 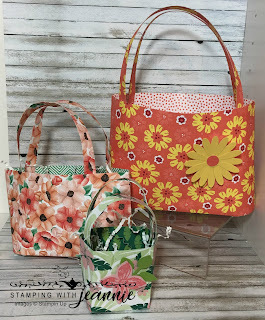 Get them soon (click on any of the items in my Supply List to connect to my store and purchase these items)! Anything else you notice that might be retiring? Yep, some of my favorite Night of Navy gingham ribbon is going away as is the Share What You Love specialty DSP that lines the bottom of my birdcage. Oh yes, and you'll want the Paper Trimmer and the Big Shot before those items are gone as well!! *Please note that I have not included all items on my supply list -- I added the items only if they are retiring or are essential to the projects I made.